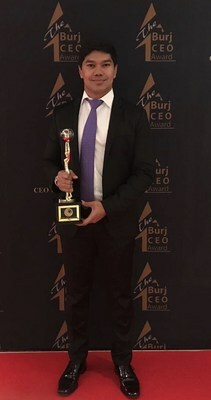 DUBAI, United Arab Emirates, Oct. 11, 2017 /PRNewswire/ — On 10 October, one of the real estate world’s up-and-coming young entrepreneurs, Zaki Ameer, founder and CEO of Dream Design Property, travelled to London to receive the “Best Global Real Estate Investment Company” BURJ CEO award from the CEO Clubs Network Worldwide. Royal family members from both the United Arab Emirates (UAE) and the United Kingdom (UK) attended, as did UK government officials and members of the UK Parliament, top international business executives, and VIPs from all over the world. The award, which CEO Clubs Network Founder Tariq Nizami dubbed “an Oscar for CEOs,” honoured Ameer for his positive contribution to the booming Sydney real estate market, which he has recently expanded into the UAE and Eastern Africa. A panel of international judges chose Ameer for his work in mentoring investors to choose real estate investment strategies that produce hefty returns on their investments. Ameer hasn’t always been so successful. At only 18, he came to Australia as a student with only debt and a dream. Determined to stay, the plucky young man worked days and studied nights to claw his way out of debt to a bachelor’s degree in business. After finding a mentor, Ameer tried his hand in real estate investment. Fast forward a few years, and Ameer had amassed a successful real estate portfolio worth three million dollars. With this successful venture under his belt, Ameer founded Dream Design Property in 2012. Since then, he has used his savvy to guide his clients through the investment process. Dream Design Property (http://www.ddpproperty.com.au/) provides clients with opportunities to invest in prime real estate in the greater Sydney area, as well as in Dubai and Africa. Staffed with expert financial advisers, the company helps its clients become more informed real estate investors through education.